Like many people celebrating Customer Service Week in October, Darlene Loiacono used puzzles from the CSWeek.com website. Thank you for not SNICKERING when I handed out these puzzles. KUDOS to you for completing them all. You are such a SMARTIE pants for working them out. Congratulations you are a winner and a STAR. At the end of the week, all of the completed puzzles were submitted to Darlene for a grand prize drawing. What a sweet way to start the week! When Beth wrote to tell us about the Customer Service Week celebration at C-Tran, the public transportation company for Clark County Washington, she stressed that her budget had been very limited. Heres a rundown of some of the teams activities. Winners in the various contests received Auction Bucks, actually Monopoly Money, which could be used to bid on prizes in a silent auction at the end of the week. Reps competed in chair decorating, salsa making, and an Office Olympics. They also enjoyed having their photos snapped in a photo booth. Despite the limited budget, the homemade booth, complete with silly props, provided a great way to preserve memories of the week. 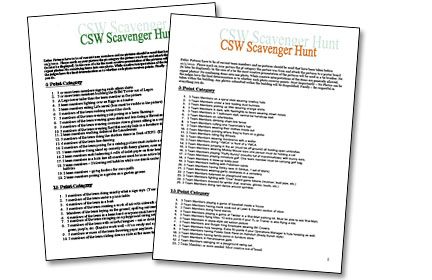 Scavenger hunts have long been a popular Customer Service Week activity. They can be used to build teamwork, flex creative muscles, and just have fun. Some of the photos are worth five points, but some are worth as much as 50 points based on level of difficulty and creativity. The team to accumulate the most points wins. Each team also mounts its pictures on poster board to share with the entire department. This creative scavenger hunt can be incorporated into almost any celebration. Click the links below to see the rules and lists of photos requested. 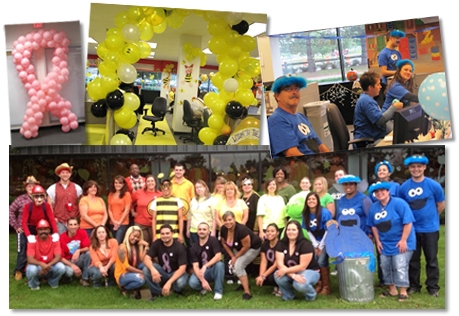 Thats how Brian Doran described the Customer Service Week celebration at 5LINX Enterprises. And clearly, the organizing committee went all out in planning an exciting week. Activities, food and fun were featured each day, but the main event was on Thursday when the department was turned into a carnival complete with decorations, 12 games of chance, and a Sumo Wrestling Ring. The inflatable ring and costumes allowed agents to compete against supervisors and the secretarial staff to take on the marketing department in this ancient sport. Leading up to the carnival was Breast Cancer Awareness Day. Everyone wore pink to show their support. Pink cupcakes were delivered to each work station. And the companys founder made a donation to the American Cancer Society in honor of his staff. 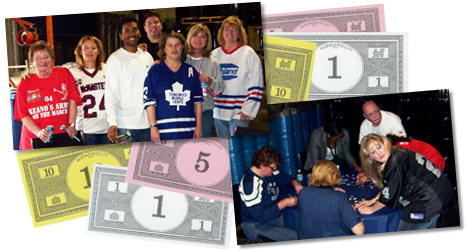 Each year, the leadership team at United Stationers plans a full week of theme days, games, food, and fun for over 250 frontline associates. One on the most popular activities is participating in classic TV game shows including Lets Make a Deal, The Price is Right, Jeopardy, and Deal or No Deal. Contestants are alert throughout the day for a call and invitation to come on down and play games. Winners may choose from a huge pile of exciting gifts including cookware, a tablet, gift cards, and more. Additional popular game show activities include Fear Factor, Amazing Race, Jeopardy!, Cash Cab, and Survivor. What do Cookie Monster, a swarm of giant bees, and a huge pink ribbon have in common? They were all part of the Customer Service Week celebration at Adecco Staffings shared services center in New York State. Each of the work teams was assigned a color and challenged to decorate their area with an appropriate theme. The orange team created a fall display with life-sized trees. The yellow team created oversized yellow and black bumble bees in their work area, which was renamed the hive, and the blue team created a Cookie Monster family reunion. It was a fun challenge, and one which had everyone working together. 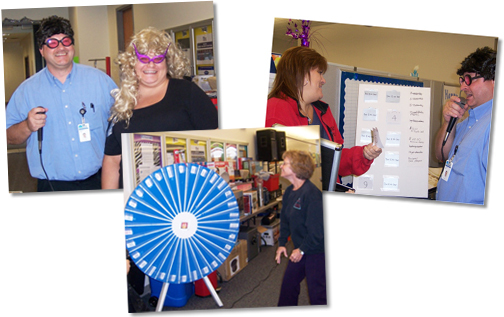 Each day of Customer Service Week 2011 was packed with activities at Modern Medical. In fact it was so packed that some events ran over into the next week. On Friday, executive staff were invited to the service department to act as judges in the cubical and cake decorating contests. The judges were so impressed with the spirit of the celebration, not to mention the creative cakes and cubicles, that they announced a pizza lunch for everyone and a casual dress day for the following Monday. This surprise recognition added to the event and extended the fun into the next week. Awards in a wide range of categories. Groupe Lacasse is located in Quebec Canada, where French is the primary language. While the group celebrated with official English language materials from CSWeek.com, they did recognize reps expertise with French superlatives. Fortunately for us, the translations are clear. Some of the categories included: Miss Sympathique, Mr. Confiant, Miss Energique and Mr. Jovial. In any language, this team had a winning celebration. 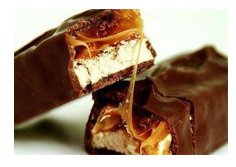 Click here to see the whole Powerpoint presentation. 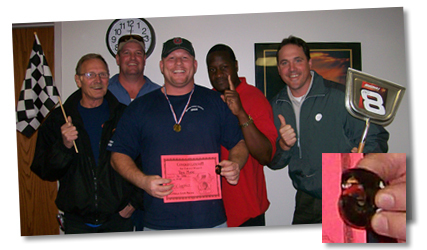 Throughout the week, customer care teams at Puget Sound Energy vied to become Olympic Champions. Hosting a wide range of activities in a variety of locations, kept each activity fresh and challenging. The week began with the opening ceremonies on Monday with an Olympic Torch Relay through the Access Center, Billing, Vendor Collections and Payment Processing departments. At the Opening Ceremony, teams received their flags, T-shirts and goodie bags. The games began in earnest on Tuesday with a day of trivia contests. Throughout the day staff received questions about Olympic and company traditions via email. Winners received small gifts throughout the day. On Wednesday, the competition heated up as all 14 teams filled the parking area for activities such as bowling, tricycle races and scooter races. The final event of the day was the Outrageous Run with all of the teams participating in an outdoor obstacle course. On Thursday evening, the service teams gathered at an indoor go-kart raceway to compete for prizes and enjoy dinner together. The week came to an end with Closing Ceremonies for each team. These included a State of the Business report followed by recognition and awards. 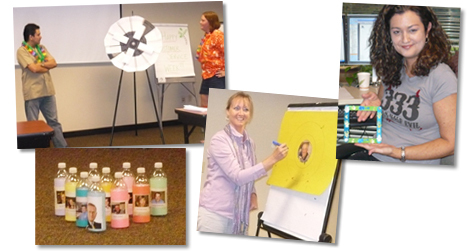 While most Customer Service Week celebrations last for just one week, Jane Leahy keeps the fun going all year long. At CSC Contact Center Solutions four locations, attendance is critical to providing outstanding service and support. For each week of perfect attendance, frontline reps are rewarded with a raffle ticket. They save those tickets until Customer Service Week when they are entered into a prize drawing. The more tickets a rep enters, the more chances to win prizes such as gas cards, gift cards and music cards. Its a wonderful way to focus on attendance and on the upcoming celebration. In addition to the raffle, Customer Service Week was filled with outdoor carnival games and indoor contests like a no-hands marshmallow eating contest, a limbo contest and a cake walk, featuring homemade cakes. While we always advocate planning early, heres one team that learned about Customer Service Week just a few days ahead of time. 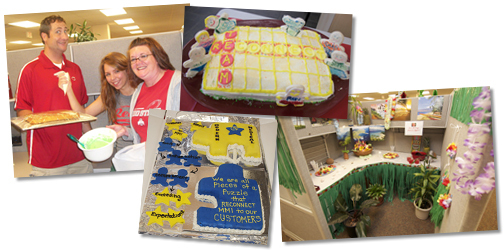 Undaunted, the customer service team at The Institute of Internal Auditors put together a wonderful celebration. Their keys to success were asking other departments to sponsor activities, and creating low-cost games, which poked a little good-natured fun at senior management. Monday was sports day with the marketing department sponsoring a pizza lunch. The days main activity was a low-cost bowling game. Bowling pins were created from empty soda bottles and to add to the fun, photos of the leadership team adorned each bottle. Tuesday was color day and the team dressed in Customer Service Week purple and yellow. The membership and human resources departments provided a catered lunch and the team played a home-grown game called Sharpie Put. The object of the game is to hit a paper target with a Sharpie marker. And because management came in for their share of ribbing, the center of the target featured a photograph of the departments vice president. Wednesday was cozy-slippers day. And who wouldnt like to wear slippers at work. The certifications department provided breakfast and the team played basket toss with a foam ball and a trash can. Thursday was crazy-hat day with the event services group sponsoring breakfast. The team got to know colleagues with a matching game. A sheet was created for each of the two service teams. The sheet simply included a photograph of each team member. Then the sheets were distributed to the other team. Next, it was time for reps to write down the name of each person on the other team alongside their photograph. And if a rep didnt know someones name? Then she had to go to the other department, introduce herself and ask. Friday was Hawaiian shirt day. The bookstore department and the research foundation sponsored breakfast and both teams played a trivia game, which helped them continue to get to know each other. Each spin of the wheel revealed information, which had to be matched to the correct rep. Finally, throughout the week reps were given time off the phone to work together on fun craft projects like making photo frames for their desks. 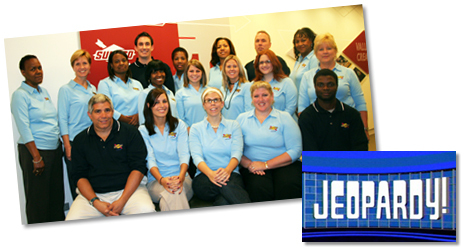 Television programs have inspired many Customer Service Week celebrations, and this year was no different. 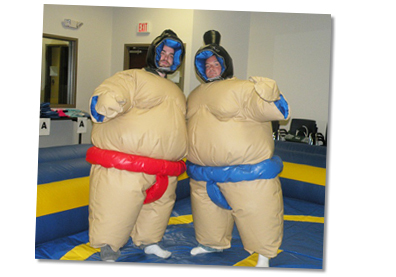 CNA Surety took their contest to the limit with some gross-out fun. Each year the service team prepares an IT Management Challenge for their CIO and directors. This years challenge was based on the TV show Fear Factor. The show pits contestants against each other in a series of challenges. Typically this involves two physical and one mental challenge in which the contestant must do something frightening or gross. 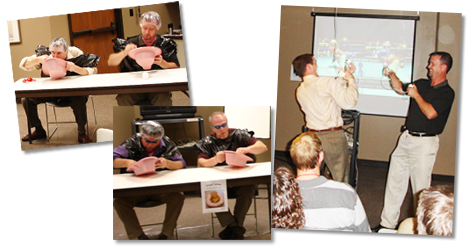 For the CNA version, the management team participated in a physical challenge (Wii boxing); a tactile challenge, in which they put their hands into boxes full of Jell-O and pudding and tried to identify buried computer parts; and a mental challenge in which the contestants had to eat yellow Jell-O from a bed pan as quickly as possible. Fortunately, Deb Anderson reports that everyone on the management team is a good sport and a fierce competitor, and that they are already buzzing about next year. Additional popular game show activities include Amazing Race, Jeopardy!, Cash Cab, and Survivor. The team at Demag Cranes & Components has been celebrating Customer Service Week for nine years. And the celebration just keeps getting better. In a week packed with events and activities designed to appeal to everyone, two activities are real standouts: The Pumpkin Decorating Contest and the Customer Photo Match Contest. The company-wide pumpkin decorating contest provided an opportunity for each department to show its creative side and for people to get to know each other as they viewed the entries. 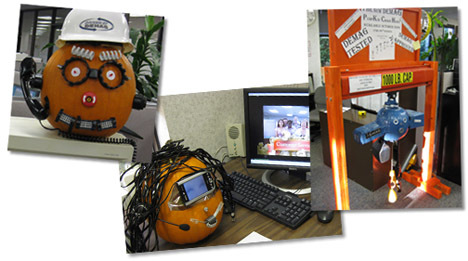 Entries ranged from an all blue "pumpkin chain hoist" from the material handling group, to a pumpkin with wire looms and LED eyes from the electrical engineering group, to a pumpkin featuring a photograph of eyes on a PDA from the IT group. Complete contest rules are available here. Typically the photos showed customers out of the office enjoying their hobbies, families and pets. The photos provided an opportunity for reps to see their customers in a new, and much more personal, light. Throughout the week, reps at Kansas City Life Insurance Company, participated in a daily puzzle or contest. They also enjoyed one large scale game, based on the Discovery Channel hit, "Cash Cab." On the program, unsuspecting New Yorkers hail a taxicab only to discover that they have entered a game show and can win cash for answering the drivers questions correctly. In the Kansas City Life version, reps were asked to report to the front door of the building at designated times throughout the day. Awaiting them was a managers car decorated with play money. After the reps piled in and the rules were explained, the car took off on laps around the parking lot. Reps responded to a range of questions receiving play money for correct answers. 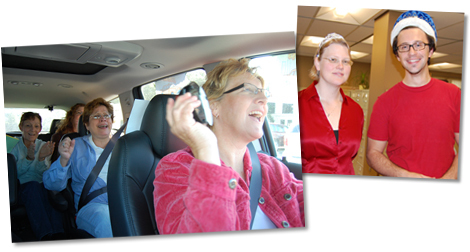 However, after three incorrect answers, the ride was abruptly over, reps exited the car, and walked back to the office. The play money reps won could be used to buy raffle tickets for daily prize giveaways or to vote for the king and queen of service. To enter the royal competition each rep simply hung a colorfully decorated brown paper bag outside of his or her cubicle. During the week reps cast their votes by filling the bags with play money. Reps could drop out of the competition, at any point, and either buy raffle tickets or support another rep. According to the organizers, "the campaigning was furious" by Friday when the king and queen were finally crowned. Additional popular game show activities include Fear Factor, Amazing Race, Jeopardy!, and Survivor. When ODW Logistics celebrates Customer Service Week, they have to overcome a few obstacles. Two of the most significant being that there are 300+ people celebrating and they work in seven different buildings at the Columbus, OH, campus. Nevertheless, they put together a number of activities that everyone could participate in and scheduled them carefully throughout the week. In addition, the entire company got together for a tailgate party on Friday. As the culmination of the week this was the time to vote for customer service rep and warehouse person of the year and for winners of the various challenges to receive their prizes. Crab races — Hermit crabs and their handlers competed in a fast-paced battle of speed and skill. People poker — Each person received one card per day. Hands were compared throughout the week and winners announced at the tailgate party. If my math is right, there were a total of 28 decks of cards required for this one massive game of poker. 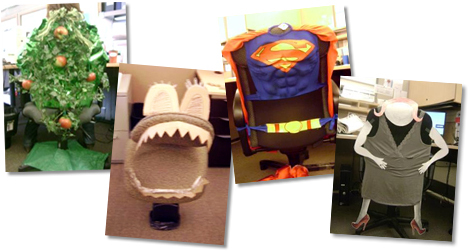 Walk your way to wellness — Prizes were awarded to employees who logged the most miles during the week. Announcement (word) bingo — Prizes were awarded to employees who completed their bingo cards during senior managements weekly companywide address. Now thats one way to get everyones attention. There are several activities that people love and that are incorporated into many celebrations. With a little creativity, you can make those activities uniquely yours. The team at the CBK celebrated with a different activity each day including a creative dress-up day and a skill-building cake-decorating contest. To kick-off the week reps were asked to dress as what they wanted to be when they grew up. You can just imagine a call center filled with ballerinas and princesses, firefighters and football players. Next the team competed in a cake-decorating contest. The staff was divided into teams of two. 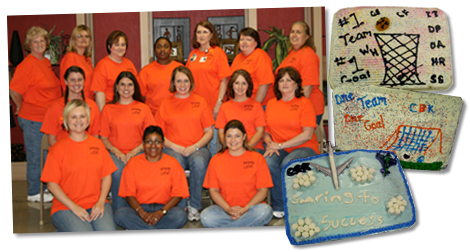 Each team received a sheet cake, and an assortment of frostings. They were challenged to create a theme cake for the week. More than just a decorating contest, this was also a communication building exercise. After the reps briefly discussed how to decorate their cakes, one rep left the room while the other worked. After several minutes the reps switched places. It was up to the second rep to complete the cake based only on their conversation and the work that had already been done. If this team is as good at communicating with customers as they are at decorating cakes, there should be very little mis-communication at CBK. A fun-filled afternoon playing the game-show favorite Jeopardy! was the highlight of a very full Customer Service Week at Sunoco Chemicals. The questions were developed based on the companys customer service practices and provided a fun and engaging way for reps to show off their skills and job knowledge. Jeopardy! is also a great game to incorporate into your team meetings and teambuilding activities throughout the year. So how exactly does Jeopardy! Work? The game consists of a series of questions, which are asked in the reverse of the standard quiz format. Three contestants are given the answer and vie to be the first to come up with the correct question. In the game show there are two main rounds, each with five answers of different prize amounts and difficulties in six different categories. The beauty of this game is that it can be easily scaled up or down to meet your needs. A: Are you able to hold? Q: What should you say before placing a caller on hold? Q: What is to vent? Q: What do you do before picking up the phone? In addition to playing Jeopardy!, the team started the week with a kickoff breakfast with their management team and internal customers. They also created a movie from photos of their teambuilding events throughout the year, enjoyed daily giveaways and snacks, played puzzles and games, and capped off the week with 15-minute chair massages. Additional popular game show activities include Fear Factor, Amazing Race, Cash Cab, and Survivor. 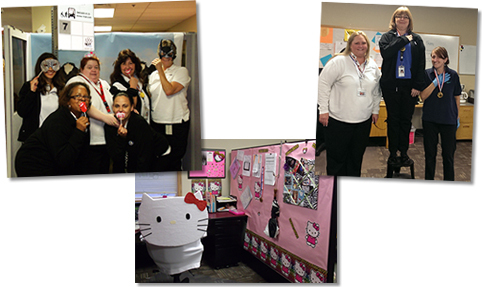 There was a lot going on at Ashland Canada during Customer Service Week. But one activity really caught our attention because it ran through the entire week culminating in a prize drawing. Every half-hour a question from Trivial Pursuit was emailed to all reps. The first person to reply with the correct answer received $1 in Monopoly Money. At lunch, teams competed to complete two jigsaw puzzles. Each player on the fastest team received $2 in Monopoly Money. Reps also received Monopoly Money for Thank-You notes sent to customers and for letters of appreciation received from customers. The funny money fun wasnt over until Friday when reps redeemed their money for raffle tickets and the chance to win one of several prizes. The more money they earned, the greater the chances of winning. In addition, the team celebrated with a kick-off Breakfast of Champions at which each employee received a Thank-You card signed by his or her manager and a Customer Service Week t-shirt. Reps also shared a meal with internal customers. Each rep was asked to invite one internal customer to have lunch on site. It proved to be a nice opportunity for reps to meet face to face with the people they work with on a daily basis but seldom have time to get to know. Friday was sports day at Advanced Health Media (AHM) where lots of individual sports themed activities added up to a fun-filled day. Some events were held indoors with limited room for fans while others, such as the three-legged race and dizzy bat race, were held outside. Reps were encouraged to attend the outdoor events to cheer their coworkers on. To keep everyone involved in all of the activities, up to the minute results were posted on a scoreboard at the AHM website. Adding to the fun, vendors made their way through the office during the 7th Inning Stretch tossing snacks to the spectators. 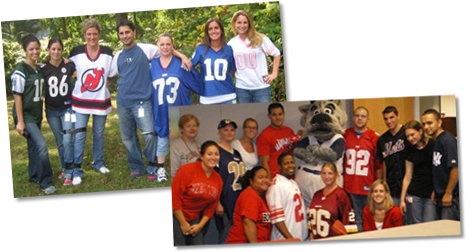 And what would a sport day be without reps coming to work dressed in gear for their favorite team. Finally, reps were able to win tickets to Giants or Jets games. Working with the AHM vending machine contact, special stickers were placed on one item in each of two vending machines. The lucky person to receive a sticker won the tickets. Everyone loves to play games during Customer Service Week. And why not? When we play together and laugh together we build strong bonds that last all year long. This challenge is based on the childrens game Telephone and provides an important lesson on the importance of two-way communication. Teams of five lined up. The first player was given instructions for a product order. The instructions were passed down the line from person to person until the last player assembled the order from the materials provided. The team to correctly assemble the order in the least amount of time was the winner. Based on the popular reality television show, teams followed clues throughout the building to collect and assemble puzzle pieces. Click here for details on another celebration featuring an Amazing Race event. Thursday was the Building Bridges Challenge. 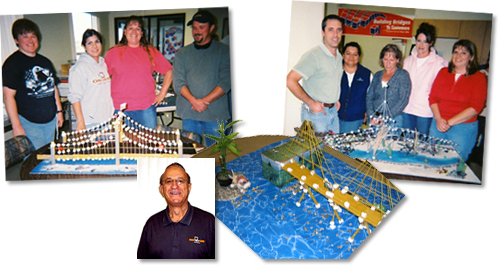 This event tied in with the 2006 Customer Service Week theme Building Bridges to Customers. To reinforce interdepartmental teamwork, teams were made up of staff from several departments that work together and support each other. Teams were given boxes of spaghetti and bags of marshmallows to build their bridges. Some of their impressive creations are shown above. The simple but effective Customer Service Week celebration at Aetrex Worldwide was created to help reps get to know each other better and to keep spirits high during a stressful companywide software conversion. The following four activities could easily be incorporated into a larger celebration as well. Aetrex Hold Em — With the current popularity of poker this activity cant miss. Every day, each rep chooses one playing card from the deck. By the end of the week, each rep has a five-card poker hand. Each hand is taped to a large piece of poster board and the rep with the best hand wins. Not a poker player? Just click here to learn the rules. Guess Who — In this classic Customer Service Week activity, each team member brings in a baby picture and reps try to match the bouncing babies with their coworkers. Middle Name Game — Reps compete to see how many of their teammates middle names they know. Finally, after getting to know each other a little better, the team celebrated the week with a pizza party and thank-you gifts. On Monday morning each employee received a bandanna, which indicated which of three interdepartmental tribes they belonged to. Team captains were assigned when three vice presidents drew tiki cups from a box. Tribes could also lose points. For example, a team member not wearing his or her bandanna cost the tribe one point, and being late to a tribal council meant the loss of 10 points. The remaining tasks were trivia questions in the categories of history, geography, entertainment, general knowledge, and sports. Additional popular game show activities include Fear Factor, Amazing Race, Jeopardy!, and Cash Cab.